The Krugersdorp sector 7 Community Policing Form (CPF) have been doing remarkable work when it comes to taking the safety of their local community into their own hands. 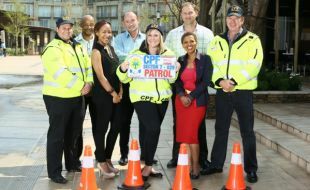 The CPF is a community based non-profit organisation which is led by a committee of volunteers who live within the area that they patrol. Their team consists of more than 30 people, 20 of which are active members. “Their outstanding efforts have been noticed by the community and Silverstar Casino and we are all benefitting. As a business in this community we wanted to ensure that they are able to continue their great work with the right equipment that also ensures their safety when they are out there and looking after our safety,” says Shane Collinson, Director of Operations and complex General Manager at Silverstar. In support of the CPF and their mission, Silverstar Casino recently donated a number of items to the worthy cause amounting to over R140 000. Equipment included a back-up repeater, radios, patrol boards, vehicle signage, traffic cones as well as winter jackets, reflector vests and caps for patrollers. “Through Silverstar Casino’s generous donation, we are able to enhance our effectiveness in combating crime in our neighbourhood and community,” says Casper van Zyl, Chairman of Sector 7 CPF. “A main focus of ours is to make sure that community members are aware of our patrolling unit and are able to identify us, so that we can be trusted to assist them in times of need. This donation has helped us reach this objective and for that we are extremely grateful,” concludes Mr van Zyl. Collaborating with government positively influences the way the corporate sector as well as sports federations and institutions make a sustainable contribution to sports development in schools, particularly in underprivileged areas, according to Vusi Dlamini, Group HR Director for Tsogo Sun. “The Department of Sports & Recreation together with the Department of Education have created a Memorandum of Understanding that outlines government’s objectives in 16 selected school sporting codes – and aligning sporting programmes within civil society with these objectives will ensure that the overall impact on sports development is significantly greater than could be achieved by these sectors individually,” says Dlamini. Shanda Paine, Group CSI Manager of Tsogo Sun, says that government’s inclusion of sports and arts into the National Development Programme has made sport a national educational imperative, and one that Tsogo Sun has embraced in its Sports Academy and Arts Academy that impact many schools in disadvantaged communities. Tsogo Sun believes sports and arts change lives and bring about new attitudes, and has joined forces with like-minded organisations to develop community programmes that are aimed at making a tangible difference in the lives of underprivileged communities – enabling change by creating reasons to be enthusiastic about the future. These extensive programmes have already had a positive impact on thousands of learners across the country. Tsogo Sun’s key programmes are in line with the objectives and purpose of government’s existing School Sports Framework priorities, which include mass participation, identification of talent, making sure that marginalised communities are not excluded, enabling coaching the coaches programmes, and integrating extra-curricular activities back into schools, while facilitating events and opportunities in the areas of chess, arts, soccer and education programmes. As a basic fundamental, Tsogo Sun is committed to education and development. Through its Learning Academy, the group constantly educates and develops staff, provides bursaries to students and gives young people access to national historic and educational facilities such as the Apartheid Museum, as well as supporting complementary programmes such as the Primestars, Columba Leadership, Olwazini Discovery Science Centre and a number of bursaries at schools and tertiary institutions. The Tsogo Sun Arts Academy All Stars, as the top young stars of the Tsogo Sun Arts Academy programme are affectionately known, yesterday appeared in a music video with top SA Afrikaans singer and host of Be Your Dream on DSTV’s Kyknet, Anaïs Marais. These children, the cream of the crop from the 12 schools in the Tsogo Sun Arts Academy who, due to their innate talent are given additional training in the performing arts, were selected to perform in the music video for the track entitled Dance Like David - a co-lab between Anaïs and Nate Butler, an award-winning American songwriter, music producer, and recording artist, whom the children were also able to meet and interact with. Nate has been instrumental in the international sale of 45 million records and has worked with multi-platinum artists such as Luther Vandross, Victoria Beckham, Craig David, Backstreet Boys, Christina Milian, Stacie Orrico, JoJo, and others. In addition, Butler helped launch the careers of many artists, including 3LW, S-Club 7, Blue and Sugababes. 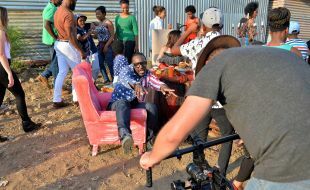 The music video was filmed in Diepsloot yesterday and comes just days after Anaïs and Nate presented a full-day workshop with the children at Silverstar Casino in the West Rand of Johannesburg. The session, designed to expose the children to exciting new experiences within the field of the arts that they would never normally have, saw Anaïs and Nate talk on their individual perspectives of the industry, both locally and internationally, and encompassed everything from acting to modelling, singing and dancing. The children were taught what to do, not to do, and what to expect when going into the industry, before being surprised with the news that they would be appearing in the music video, which is due for nationwide release in two weeks. Even more exciting, is that that six of the Tsogo Sun Arts Academy All Stars children were given a spot in the finals of the New York Film Academy’s Musical Theatre School bursary programme. The workshop was used as an audition in which six of the children outshone the rest for a place in the final of the bursary selection process, which will be held at Silverstar Casino on 16 May. All 12 children will perform at the opening of the finals. The Tsogo Sun Arts Academy programme currently supports 480 children across 12 underprivileged South African schools – 40 in each school – in Diepsloot and Mayfair in Gauteng. The full-year Arts Academy curriculum is designed as an all-encompassing programme that uses the arts as the foundation for opportunities for growth and learning for the children in both primary and high schools. It covers the basics of drama, dance, vocal training and voice projection, as well as carefully structured life skills course that empower the youngsters to make sound choices throughout their lives. The fact that the Tsogo Sun All Stars were last year invited to perform at corporate events such as conferences and the SA Business Women’s Council, and have already received numerous requests to perform at events this year, bears testament to the momentum gained in only four short years and the credibility of The Tsogo Sun Arts Academy programme. Read for yourself how our holistic approach to our sports and arts development programmes has an effect on the lives of South African children. According to 19-year-old Nkosikhona Ndebele of Diepsloot Number 3 High School, the Tsogo Sun Arts Academy “inspired me to become a better person”. That’s the holistic nature of the Tsogo Sun CSI flagship school programmes that impact thousands of children’s lives every year. “Our sports and arts programme are designed to have a tangible impact on young lives – particularly the lives of disadvantaged children – and to do more than just foster an interest in a sport or the arts. Our Tsogo Sun academies use sports and arts as a medium to deliver life skills, leadership and healthy lifestyle information, while also reinforcing the importance of education to young learners in school, ultimately aiming to nurture the children’s wellbeing,” says Vusi Dlamini, HR Director for Tsogo Sun. It’s paying off, according to reports from youngsters, facilitators, teachers and parents. Ndebele says he used to be a bully at school, taking other kids’ money because “everyone else was doing it” and hanging out with a bad crowd that negatively influenced him. “But my attitude changed when I joined the Tsogo Sun Arts Academy. It has helped me become more respectful and more disciplined and made me see the importance of being a positive role model to others. It has taught me to be humble and to communicate with other people without being violent. There is now a lot of progress in my life.” As a result, his school also discovered he had leadership skills and he was elected school president. The Tsogo Sun education development programmes cover these aspects and encourage the children to write reflectively about their experiences and learning. 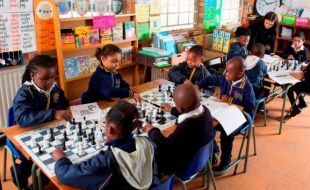 Bree Street Primary School is running both the chess and arts programme through Tsogo Sun and educator Waheeda Mohamed states that it is making a dramatic difference in the children’s lives. Most of the children are from communities that “would have very little or no opportunity to attend programmes like these without sponsors,” she says. The festive season is almost here and what better way to kick it off than with a fresh, funky “Cliffmas” Carols end-of-year sing-along? Whatever you celebrate, come and celebrate with Gareth Cliff and the crew for a fun family night out and lend support to a worthy cause. Gareth is launching the holiday season with a fundraising event on 3rd December 2014 at the Lyric Theatre, Gold Reef City in aid of Headway Gauteng - an organisation dedicated to offering support programmes to survivors of brain injury and their families. The vast majority of injuries are as result of motor vehicle, motor cycle and pedestrian vehicle accidents, assaults and sporting accidents. “This can happen to anyone” says Gareth Cliff, Patron of Headway Gauteng, “One minute you’re living a normal productive life and the next minute everything can change. The festive season is upon us and while that brings good cheer, it is also a time when reckless behaviour can change lives forever. Cliffmas Carols is a fun family outing but also, will help raise money and awareness for this cause and encourage safety, especially during the holidays”. “CliffCentral Rocks Christmas”, hosted by Gareth Cliff and sweetened by Beacon, features the multi-award winning Soweto Gospel Choir, Proverb, Jen Su, Casper de Vries and a special surprise performance by the CliffCentral crew. Tsogo Sun’s Arts Academy will also be bringing the true spirit of Christmas to the concert with a melody performance by their ‘All Stars’. “These children are part of the Tsogo Sun’s Citizenship programme in the Mayfair and Diepsloot communities. Their hard work, talent and dedication throughout the year has resulted in their selection as ‘All Stars’ and we are thrilled that these young talents can be part of this year’s show. It is a great privilege for these children, and the added benefit of fundraising and giving back to others makes this a great platform for these future stars,” says Vusi Dlamini, Tsogo Sun Group HR Director. Having the vision to be a catalyst for change is an ambitious target that many companies aspire to realise in their genuine desire to do good, to touch lives and to make a difference. It’s a vision that requires focus, effort and a programme that resonates with the people whose lives it seeks to change. 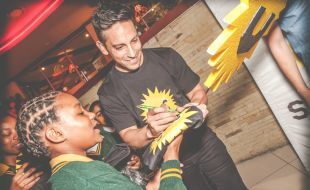 One company making significant inroads in bringing about real life changes is Tsogo Sun, through its far-reaching Arts Academy, which is unleashing the potential of hundreds of less-privileged children in Diepsloot and Mayfair, Johannesburg. Currently in its third year, Tsogo Sun’s Arts Academy forms part of the extra-curricular activities of 12 schools in the Diepsloot and Mayfair communities, teaching 480 students the basics of drama, dance, vocal training and voice projection, together with a structured life skills course that covers a broad spectrum of topics to empower the youngsters to make sound choices throughout their lives. “Tsogo Sun’s focus on entertainment and theatre meant forming an Arts Academy for young people was a natural fit. The Arts Academy allows us to expose young school-goers to the world of arts, to identify the most talented young artists early on and to nurture their talent. The programme is aligned to government priorities to reintroduce extra-curricular activities back into schools and Tsogo Sun has worked closely with the Gauteng Department of Education in identifying schools and developing the programme,” explains Vusi Dlamini, Tsogo Sun’s Group HR Director of Tsogo Sun. As the pupils present their year-end concerts in Diepsloot this week and Mayfair next week, giving them the opportunity to showcase the skills they’ve learnt throughout the year along with their own innate talents, it’s clear that this is a programme that’s having the desired results. These and the many other children have been hard at work honing their performance skills over the last nine months to show their fellow learners, parents and community members how much can be accomplished through hard work and dedication. “These young people make us extremely proud with all that they have achieved in terms of personal growth, artistic development and commitment to their academics. We are all working together with our partners, Minimax, leaders in school arts curriculums, as well as the educators and parents of the students, and while we have a long way to go yet, we have achieved much, and with continued collaboration and shows of support and encouragement from all involved, there is no limit to what these learners can achieve,” says Shanda Paine, Group CSI Manager for Tsogo Sun. The Tsogo Sun Soccer Academy players are catching the eyes of scouts from the professional leagues as their talent comes to the fore and the teams steadily climb in the rankings of the Soweto Football League. 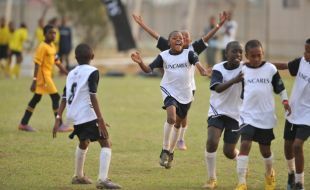 “The Soccer Academy, was created for the stars coming out of the local interschool league programme, which forms one of the pillars in the academy – the youngsters with exceptional talent who were identified by our coaches as having the potential to go further in soccer,” says Shanda Paine, Group CSI manager for Tsogo Sun. This talent development part of the overall academy consists of 80 players in four divisions - U13, U15, U17 and U19 teams. These four teams have been playing in the Soweto Football League for the past three years. Our South African Soccer Academy allows these gifted players to harness and grow their talent by competing against some of the strongest teams in their age groups in Gauteng and also providing them with a platform to gain additional developmental skills off the field through life skill workshops. This will ensure that when they are scouted these youngsters are quality all round players on and off the field, and as such represent the calibre of players that graduate from the Tsogo Sun Soccer Academy. Through the continued success of the programme and the players achievements through the Academy, the Tsogo Sun Soccer Academy hopes to conquer the Soweto Football League in due time and move into the SAFA Academy. A number of youngsters from the Academy have already been scouted by professional development leagues in 2014; two players were scouted by Bidvest Wits; five players who were at the trials for the newly promoted Vodacom (ABC Motsepe League) team in Munsieville, were signed up; and two players – one U15 and one U17 – were scouted by Kaizer Chiefs. But performance on the field is only a part of the Tsogo Sun Soccer Academy programme. Sport is a powerful medium to deliver life skills tools and leadership development, to the youngsters, while the importance of education is reinforced throughout the programme. “Some of our players might make it into the big leagues in soccer, but even so, a sound education is vital to every young South African for whatever career path they may want to pursue – and we have been delighted to see how readily this lesson is being learned by many of our Academy players,” comments Paine. Tsogo Sun took its top U19 team from the development Academy to Cape Town in October last year as a reward for hard work, commitment to themselves and the programme. These youngsters were treated to a stay in the Southern Sun Waterfront hotel, a trip up Table Mountain, a visit to Greenpoint Stadium, a game of soccer against their coaches on the beach, and most importantly for many of them, a visit to Ajax Cape Town’s training facilities. All of which were first-time experiences for these players. 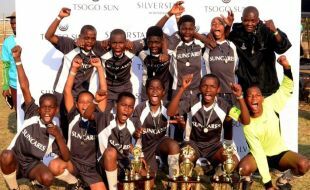 The Tsogo Sun Soccer Academy is bringing its 2014 season to a close from 19 to 21 September with a tournament on the West Rand, in Swaneville (Kagiso) – and celebrating a host of success stories from the players who have been part of the programme, some since its inception in 2010. The Tsogo Sun Soccer Academy currently operates in 35 primary and high schools in the Kagiso area on the West Rand, working with 40 teachers and more than 885 learners and local businesses as service providers. “We are incredibly proud of the real-life experiences of some of the players how they have benefited from being part of the programme and the vision they have for their future,” says Shanda Paine, Group CSI Manager for Tsogo Sun. Grade 12 learner Goitseone Pits (19) started with the Soccer Academy in 2010 and believes that without it, he would likely be in jail. “The soccer team took me off the streets and away from criminal activities that some friends were involved in. Here I learned self-discipline, to behave when I am around people and how to show respect.” Pits is looking forward to studying next year – possibly social work – and a productive and positive future. Tebogo Mpanyase, 14, attends WD Oliphant Primary School – started with the academy in 2010 at age 13 – agrees. “The Academy takes care of us. They respect us and we respect them too; they encourage us not to focus on football only.” His plans for the future include listening to his parents, focusing on school, and not being distracted by alcohol and smoking – and then one day hopefully studying medicine. Twanano Ndobe, now age 19 at SG Mafaese Secondary School, has also been part of the academy since 2010, and has shown the commitment necessary to help him shine as a soccer player. Ndobe says he did have a problem with discipline, but when he was appointed captain of his team, he had to make serious changes in his life and be the role model and the leader that the position demanded from him. Ndobe hopes that soccer will play a role in his future life, but in the meantime, he plans to study law when he finishes school. Paine notes that research on the symbiotic relationship between sport and the balanced development of youngsters shows that sport-based programmes have been shown to improve the learning performance of learners, encouraging school attendance and a desire to succeed academically. 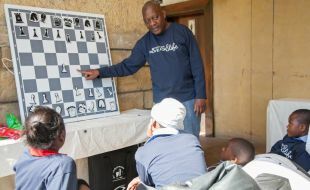 Launched less than a year ago, Tsogo Sun’s Moves for Life chess programme is taking the game to 31,000 learners in more than 100 schools and has trained over 900 teachers schools around the country, with encouraging reports of improved academic performance. In support of the proven benefits of chess as an educational tool, Susan Polgar, four-time world chess champion, says, “According to research, test scores improved by 17.3% for students regularly engaged in chess classes, compared with only 4.6% for children participating in other forms of enriched activities." Much of the success of the programme can be attributed to the fact that, while significant research over many years has established that chess contributes to many skillsets within a child’s development, the game is primarily fun and appealing to children – which means they’re gaining skills in maths, science and life skills while they’re playing. Much research backs up claims that chess improves concentration; it develops logical and abstract thinking, analytical, visualisation and decision-making skills, among others,” said von Aulock. The Tsogo Sun Moves for Life programme is divided into three key elements, namely MiniChess (Grade R to Grade 3), MasterMoves (nine years and older), and teacher training. It has been implemented in six provinces in which Tsogo Sun’s leisure destinations are located, reaching ten schools in the Soweto area; six in Diepsloot near Fourways; 11 on the West Rand; three in Welkom in the Free State; 10 on the West Coast and six in Mossel Bay – both in the Western Cape; two in Newcastle in KwaZulu-Natal; and two in Witbank in Mpumalanga. MiniChess impacts all learners in the class, and is part of the school timetable. The focus throughout the lessons and activities is on fun – learning through play.